When a Tata enterprise asks you to do a review for them, you graciously accept for two reasons. Two, because you assume the book will define the reader’s journey. One, because you trust your instinct. 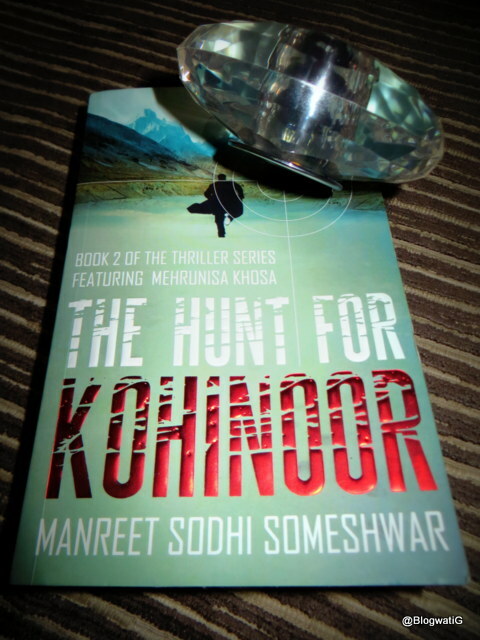 ‘The Hunt for Kohinoor’ by Manreet Sodhi Someshwar is the second book in the Mehrunisa Trilogy, the first being The Taj Conspiracy. I remember being intrigued by the first, but never got around to reading it. This I guess, I was destined to. The Hunt for Kohinoor is essentially the story of Mehrunisa Khosa. An art historian, the Mughal period being her area of expertise, a phone call changes her life. She is required to prevent the deadliest terror attack ever planned on Indian soil. Her journey will take her through the rough terrains of warring territories, and she has less than 96 hours to accomplish the impossible. Why would she do this? Because in exchange she is offered the truth about her missing father. But even as she races against time, she realizes the price to pay is not hers alone. Guns blaze in response to questions, and history has deep dark secrets that better stay buried. The quest for the cursed Kohinoor may never leave her alive. Manreet Sodhi Someshwar weaves a vivid story. She is adept at setting the stage and letting the performances speak for themselves. One read through the prologue and you know this book is going to take more than just your time. The authoress has a firm command over the subject. She has managed to craft an effective timeline, and has included screenshots of horror stories that otherwise we have dismissed as ‘news’. The book reminds you that peace is a bloody business, wherein the seeds of war are sowed; terror is then reaped in abundance. The creation of the Taliban, the sorry state of border forces, the bickering nation politics and the interference of Uncle Sam, Manreet hits the nail on the head. Some references chill you to your bones. Teens are brainwashed into being suicide bombers for a slice of heaven; women are buried alive for daring to breathe without permission. You know this happens, even as we call ourselves civilized. Yet, when you read it, you can’t help but put the book away. I did. I needed to feel the safety of my cocoon. Mehrunisa Khosa, the protagonist in the midst of action, is a character that will stay with you. Considering her lineage (a Sikh father and an Iranian mother) and her profession (an art historian), she already is ahead in the game. Apart from her skills and her composed demeanor, what drew me to her was the dry sense of humour. The time when she tells the shrine guard she had come all the way to ask for a sister to the five sons she already had. Or the time when wanted to hyperventilate, faint and get some respite from the situation at hand, like our erstwhile silver screen ladies. Mehrunisa Khosa will manage to captivate you with those green eyes, sharp memory and her unconventional mother tongue. Of the other characters, Babur Khan evokes hatred, fear and repulsion, all at the same time. His journey from a child who is bullied to one who took control of his own destiny, could belong to any rebel. His hidden artistic abilities thrown in as a reference to another dictator, perhaps. And yet what stays back is not his tyranny, but the fact that he is worshiped blindly for his barbaric ideologies. HOW has the book been treated? Divulging any more characters would be a spoiler, so I’ll step back here, but watch out for the Snow Leopard. The chapters are short but action packed, with well defined beginnings, middles and ends. Tying up of loose ends or carry overs from the previous chronicles are neatly done. Even if you read this as a standalone book, which I did, you won’t get lost. The editing is tight, the flow uninterrupted; I’d give it 4 stars in that department. I only spotted one measly typo on page 323 – Pahalwan liked to chew…..
What I really liked is that the authoress speaks her mind. Whether she is drawing inferences between 9/11 and 26/11, or talking about the apathy of a burqa clad woman in Afghanistan, Manreet tells it like it is. And that is what makes the book fly on its steam. Having said that, I did wonder about the viability of a woman going into a warring terrain and the repercussions. Somehow, that area, I felt was overlooked or glossed. The movies Khuda Gawah and Taken came to mind whilst reading some scenes. The climax too, I felt, did not match the buildup. Yes, at 425 pages it could have been a challenge. Perhaps, the descriptions of the vales and valleys could have been toned down to accommodate more action towards the last 50 pages. WHY should YOU consider The Hunt for Kohinoor? However having said that, The Hunt for Kohinoor was a book that kept me enthralled. If a person like me with no stomach for politics found it an interesting read, you can only imagine. And if you still can’t make up your mind, I’ll leave you with a few lines. Do check the official video of the book too.